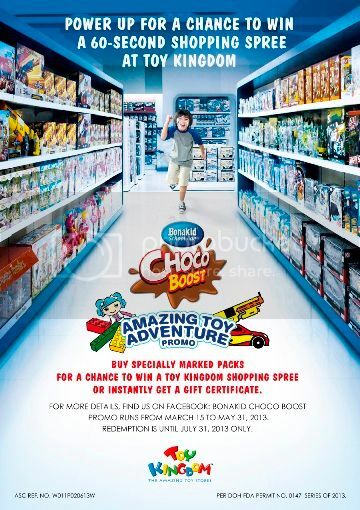 Kids, Gear Up for Bonakid Choco Boost’s Amazing Toy Adventure Promo! Two 800-gram pack of Bonakid Choco Boost were delivered to our doorstep yesterday. Our young man was excited to see the two boxes because he said he’s going to win a prize; apparently, he saw the ongoing promo of Bonakid Choco Boost on TV, and that got him pumped up. I also asked him to try this chocolate milk drink, and he obliged, because when we opened one of the boxes, he got a whiff of the sweet aroma of the chocolate milk powder inside. He drank 1 glass in the afternoon and another glass at night, and he said it’s yummy! We then peeled off the stickers in front of the boxes to reveal our prize, and we got two Php50.00 Toy Kingdom gift certificates. I was happy, but the little boy was a bit disappointed because he wanted to win the 60-second shopping spree instead. I told him we’re buying more Bonakid Choco Boost to improve his chance of winning. Your kids can also have a chance to race around Toy Kingdom and take home every doll or action figure they fancy! Bonakid Choco Boost, together with Toy Kingdom, brings the most thrilling promo for kids this summer: the Bonakid Choco Boost Amazing Toy Adventure Promo. If you purchase specially marked packs, your kids will get instant gift certificates and the chance to win an exciting 60-second shopping spree in Toy Kingdom. Bonakid Choco Boost is a powdered milk drink specially formulated to help support the nutritional needs of children 7 years and older. It has boosted levels of Calcium, Vitamin A, Iron and Zinc for growth and development. Kids will surely love it for its delicious, chocolate taste. This entry was posted in Bonakid Choco Boost, Bonakid Choco Boost Amazing Toy Adventure Promo. Bookmark the permalink. 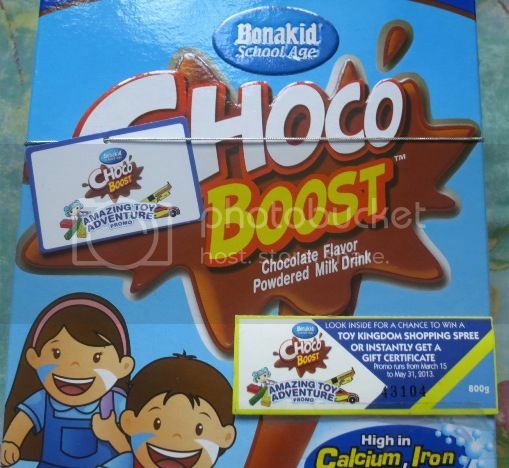 7 Responses to Kids, Gear Up for Bonakid Choco Boost’s Amazing Toy Adventure Promo! My niece loves bonakid too. Anyway, hope your kid will win the 60-second shopping spree. Oh, I got this too but I haven’t opened the package… I didn’t know there’s an instant GC inside! This might be good for my daughter, as she is quite a picky eater. Bonakid may just give her the nutrition she lacks from the food she eats. That is such a nice promo of Bonakid! Aside from the instant prize, there’s also a chance to win a bigger one.Good Luck to Justin!